I am having this idea pushed at work where the layout of information should change dependent on the amount of different items we have to display. Let me be specific: If up to 12 we should show the information in a portrait card format 3 per row, If 13 to 29 we should show each card in a separate row showing all the information them, If more than 30 we should display all the information in a condensed version of the latest where the user could see all the information through a push down. Please refer to screenshot where I breakdown the solution visually. This has nothing to do with allowing the user control over which is the favorite view, has the user will not have any control over them.. I've explained several times that a layout should not change without user control and that this will break user expectations, however I am not being able to pass the message. Is this ever acceptable and why? Where can I see this pattern being used? This is a pattern that is frequently used on sites with a lot of articles (e.g. news sites). So it is "acceptable" in the sense that there are successful sites which use this pattern, and which do not allow users control over layout. It breaks the monotony (or worse: disorientation) of a strict grid layout where cells are all the same size no matter how far you scroll. Users often lose focus after a few pages of scrolling if there is too much monotony in layout. It matches layout to the tapering attention profile of the user. For content rich sites, users will focus on the first page, and then taper their focus into 'scanning' behavior as they scroll down. By reducing the size of the cells and making them easier to scan (shift to horizontal format) the layout assists this behavioral pattern. 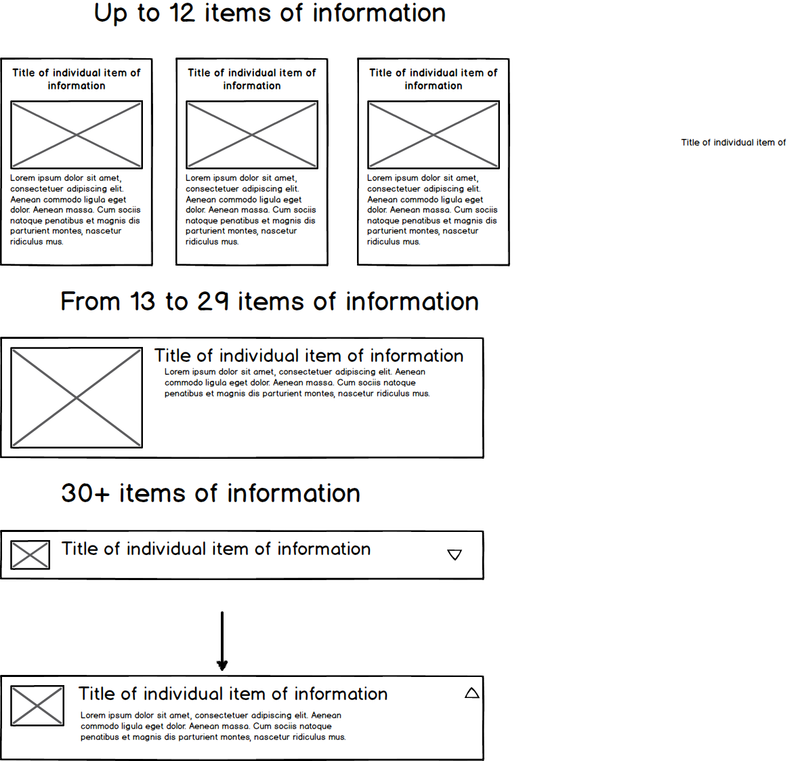 You can see the principles behind this "progressive" layout approach in many news sites (e.g. nytimes.com, qz.com and many others). These are simply reasons why certain types of sites have done this successfully. It doesn't mean that it will work for your site, but hopefully if you understand why it has been used for other sites that will help with your team discussion on whether it is going to be effective for your site. Is this for an internal site or a B2B in which there is a limited amount of vendors and product owners have a clear understanding (or think that they have a clear understanding) of the users? If this is for an internal site / small audience is there a clear understanding of the platforms being used. (Ex: everyone is on a desktop with X" monitors at X resolution and above. I ask this because I've worked for a lot of businesses that make platforms for a limited amount of users (say vendors + sales staff is less that 200) and the product owners KNOW the work as they have been in sales and KNOW the individual vendors. I've come across situations where aspects have been changed drastically to the worse (from both a design and UX perspective) but the users wanted it that way and, as far as I could tell were happy. Background: For sales staff (expert users of system). As staff is filling out information a modal may appear (a new vendor needs to be put in system - cannot continue until all required new vendor information is inputted). Sometimes a modal leads to another modal. Example 1: I had a breadcrumb showing the modals but product owners wanted it removed. Sales had to concentrate on task at hand and couldn't go back or continue until data was filled in. Months later I A/B tested the users - not one of them cared about the breadcrumb. Example 2: Flashy, blinky things were added by product owners to show that A/R (accounts receivable) was getting critical. (They were horrible). But ... the users liked them!?! I tested them with alternatives and... No. They wanted it to remain the same. All this is to say that I in a broad sense I agree with you regarding changing layout but there may be edge cases where it works reasonably well. I would, though, suggest to the product owners to give the users the option to make a change as opposed to imposing it upon them. Not the answer you're looking for? Browse other questions tagged layout user-expectation consistency or ask your own question. How should I display notifications on the tab?